Dan Rolett has been selected as the featured artist for the 28th Frank Brown International Songwriters Festival. Artworks Studio & Gallery would like to extend our most heart-felt congratulations to Dan who is also our newest artist at the gallery. Dan focuses on photography and has been a local favorite for a long time now. Dan's artwork will be available at Songwriters' venues and, of course, at Artworks Studio & Gallery at the Villagio Shops on Perdido Key. November 13th will be a special night at Artworks hosting three (3) celebrated songwriters and Dan Rolett. 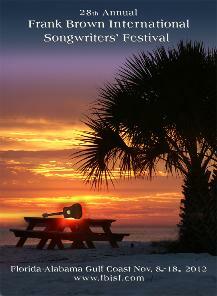 Come by and get your autographed copy of Dan's Songwriters' poster and enjoy some great music, entertainment and art.